Plasencia. Fairly sure there was a comedy Roman called something similar in a Carry On film. This one is a nice enough town with a nice enough campsite. For most of yesterday, it was an elusive goal (kilometres on signposts appear to be strictly guesswork, and have even been known to go up as you get closer), as I had my first encounter with Extremadura. Extremadura is basically the bit of Spain nearest to Portugal. To my English ear, however, it’s a combination of ‘extreme’ and ‘endure’, which seems very appropriate. The man at the campsite yesterday morning was dubious (as well as doing that thing of ignoring my lack of Spanish). “Plasencia? That’s 90km. The first 10 are OK, but after that you’re stuffed” was the gist of what he said. His extensive miming skills further informed me that he used to be a truck driver, so he knew what he was talking about. I’ve already done many 90km days, so was not overly worried. Even when I stopped for coffee at ten-thirty to see the town thermometer already showing 32 degrees C. I did make it in the end, thanks to roadside springs and a long siesta, but it was a bit touch and go. Extremadura – it’s beautiful, but it’s hard. There’s no point blaming the sun and the wind; they just do what they’ve always done. They really don’t aim to make life a misery. But sometimes, it really feels like the elements are out to get you. In reality, I’ve made good ground since my last post. I’m in Madrid, where I’ve successfully linked up with my Mum, who’s here on her first solo holiday since Dad died. This is all good. From a cycling point of view, on the other hand, Spain is hard, Spain is windy, Spain is hot and Spain is very, very lumpy. From Pamplona, I struck south-west toward Madrid, hitting the shoe-making hotspot (really) of Arnedo, and getting a bit of Russian practice in with a fellow called ‘Alfredo’ from Armenia before climbing my first 1000m-plus pass en route to Soria. Literally the high point of my travels in Europe (at least until the return journey). So, all good so far. 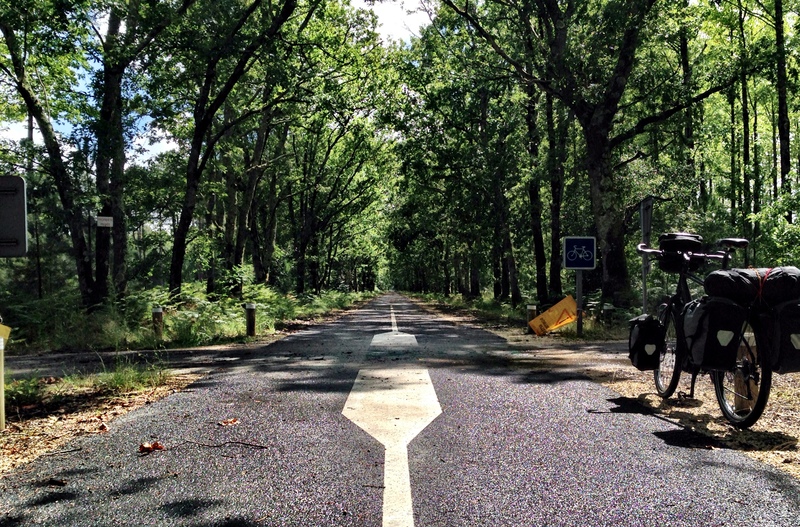 Then I made the terrible mistake of taking some well-meant route advice from a fellow cyclist. Or I made the terrible mistake of asking the wrong question to a fellow cyclist (it’s not impossible that me telling him I was heading for a plane in Portugal may have influenced things). Whichever of those actually happened, and I’m still not sure, the result was the same. Cutting a long story short, I ended up on a 100km detour, with two days of 35+ degrees centigrade heat and constant headwinds. Two days of grinding endlessly up hills before being pushed backwards by the wind on the downhills. Two days of sweating and sunburn and diesel fumes. Yuck. There were a few bright spots. The old man who completely ignored the fact that I spoke no Spanish (this seems to happen all the time), and dragged me off to look at some giant fish in the river. I think he wanted me to try and tickle the trout with him, but I didn’t really have time. And then he (I think) gave me a quick run-down on all the local Roman ruins. The toothless Spanish farmhand in his dying little van who tried really hard to give me and the bike a lift to avoid the midday sun. And then drove off, cackling and whirling an index finger around his temple (no idea what he meant), in a cloud of black diesel fumes. And, of course, the warm glow you get when you discover that someone else has paid for two nights in a hotel in central Madrid for you. Thanks, Mum! The delights of sub-dial-up internet speeds mean that photos are few and far between again. I’m sorry. I’ll do better, I promise. I’ve hit a few milestones over the last few days, which make progress seem a little more real than just a continuous stream of ’95km, 350 metres of climbing’. Some of these were intentional, some not, but as I roast in the midday sun in Pamplona, they do give me a little confidence that this trip might be doable. 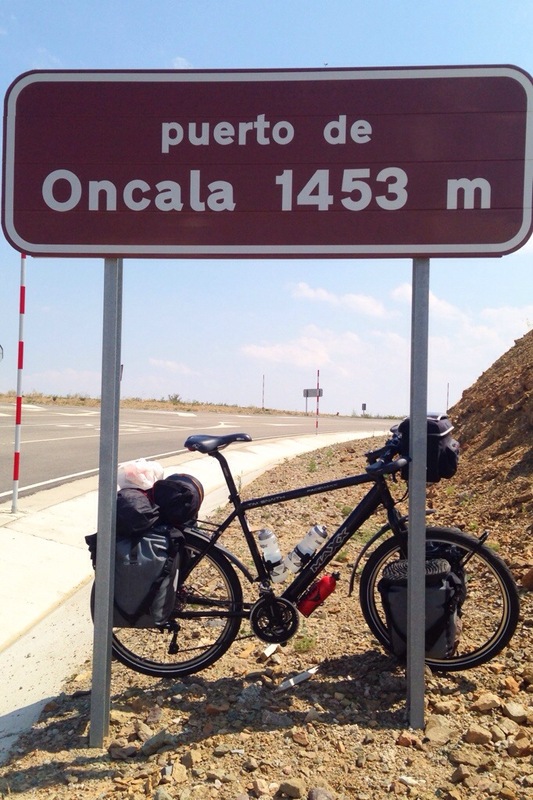 Let’s see… I’ve hit country number three (including the UK), entering Spain yesterday. I’ve hit the 1000km mark in terms of distance, and I’ve endured my first day with over 2000 vertical metres of climbing (crossing the Pyrenees). And, entirely accidentally, my first 100 mile day. Not too bad, then. On the other hand, there are a few issues. An annoying rattle on the bike (or in the bags) which I can’t trace, problems with routinely getting enough water (saved by roadside springs yesterday), and a nagging feeling that I’m spending too much money. Still, must be all sortable, I guess. Though I kind of knew the Pyrenees were going to be a big test, I was able to forget about them for a few days, and put in an accidental 100 mile day while outstandingly failing to find a campsite. I’ve no intention that 100 mile days become the norm, but it’s nice to know you can if you want to. After eight days in France, I was feeling confident that my French had improved sufficiently to pass for a local. An illusion shattered as I rolled into Bayonne. I stopped in the town centre to check my map, and was immediately interrupted by an Australian voice asking if I needed any help. In English, naturally. I looked up to see a tandem, with a fairly typical Aussie bloke (tats, shades, three-quarter-length shorts, goatee) on the front. And an oriental (maybe Chinese?) lady in a floral summer dress and floppy straw hat on the back. After establishing that I was heading south, I then got verbal directions for the next 30 miles. In 30 seconds. None of which I managed to memorise. Oh, well… I have no idea whether these two just hang around the town centre waiting for cyclists to arrive, or what, but it was a nice (if slightly bizarre) welcome to a lovely looking town. But I couldn’t dally; the mountains awaited. Yesterday was the day. I’d pre-planned roughly where to cross the Pyrenees, spotting a nice low(ish) pass at 600-and-odd metres. My valiant (smashed but pluckily soldiering on) iPhone guided me there, and I ticked off my first ‘mountain’ pass! Pamplona was only another 60km or so. 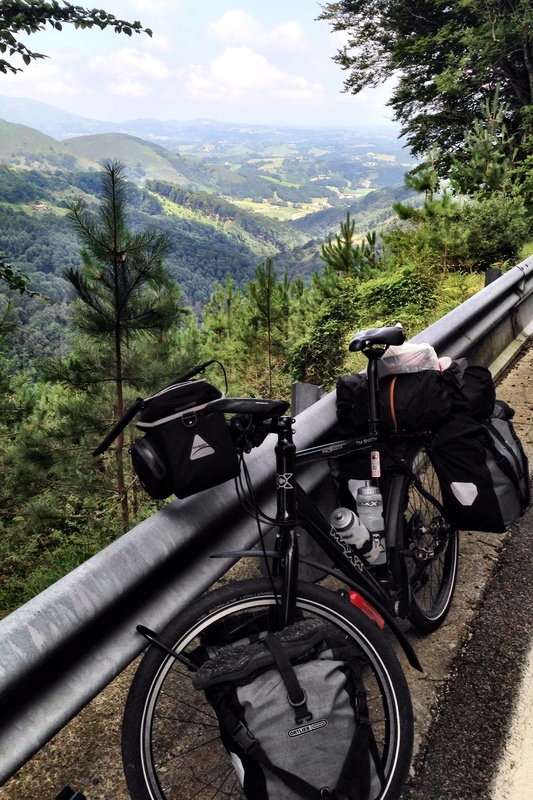 It was all too, erm, Pyreneeasy. Sorry. Unfortunately, relying entirely on the phone meant that I missed the fact that my intended road into Pamplona became a semi-motorway from which bikes were outlawed. Never mind, I’d take the old road; must run pretty parallel… Some hours later, trekking up a second, 700m-plus hill, I was not a happy bunny. Over 2000 metres climb in a day is for the racing snakes of the Tour de France, with their lightweight carbon-fibre bikes and back-up cars. Not really for an elderly gent lugging 40kg of bike and bags. Let’s just say it was a long, long day. By the way, I’ve finally added a map and some stats (everyone loves stats!) to the Progress page, for your delectation and delight.